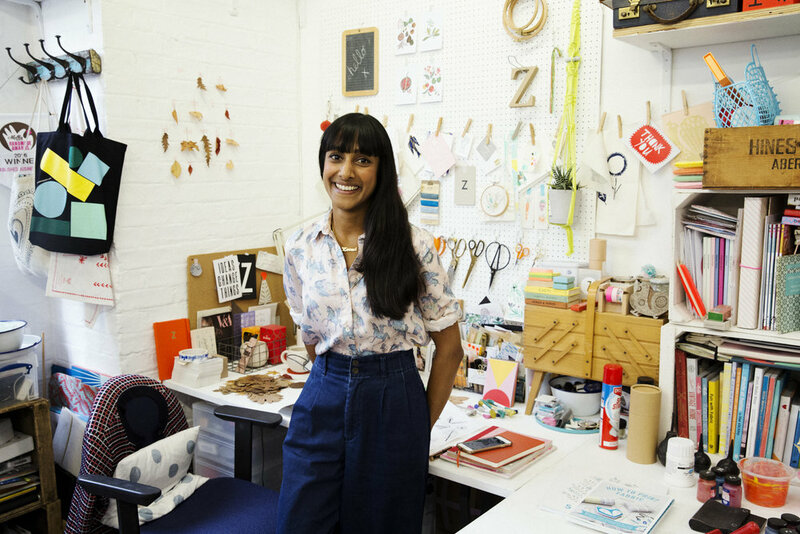 Zeena Shah has been designing and printing her own line of textiles for close to a decade, she’s had two books published, and been running regular print workshops on the side, too.In fact, Zeena’s such a powerhouse she considers taking on a regular job with a children’s book publisher as, “taking a break”. We met with the print designer at her Dalston studio, to talk pom-poms, remembering to breathe and making it up as you go along. I’ve got a new collection of print designs that will soon be going off to Korea and Japan soon. I’ve been drawing, and collecting lots of leaves – I draw inspiration from nature, and foliage and florals have become my handwriting. I’m also working for a children’s book company at the moment, which is really nice. We’re designing a whole new range of gift wrap, greetings cards, possibly notebooks and gift-tags. Although I mainly work with print design, I’m also doing product design. I’m teaching workshops as well, I teach a regular workshop at Drink, Shop and Do once a month, an introduction to screen-printing, and how to do it from your tabletop. That’s it really. Did you always know you wanted to be a print designer? I didn’t know until I got to art school. I started my art foundation, tried screen-printing and fell in love with it. It’s so fun. Its just so immediate, and very rewarding. I went on to do a BA in textiles at Chelsea, tried knitting, weaving, embroidery, but print design just fit. I got it, it came naturally. Doing what I want to do, doing something I love. I never really have that moment of: “Eugh, I don’t want to get out of bed”, it’s always wanting to do the next thing and almost do everything. It happened by learning, throwing myself into everything, doing every event under the sun and making every product. I love clothes, and I have so many. It’s always a bit of denim, if it’s a comfy day it’s Converse, but otherwise it’s a clog. Today I’m wearing a design by my friend Vicky, who runs a company called Silk and Favours, I really like wearing stuff that is made by friends. It’s always denim and print, I’ve got so much in my wardrobe, and very 70s at the moment. It always starts with a cycle ride, to the studio or the office. I try to come and work here as much as I can, but it can be difficult sometimes as you often have meeting days. I live in Clapton, so just over the Downs, often stopping at Mouse and De Lotz for a coffee – I probably pay a lot of their wages – and then it’s in here. I learnt over the years to break my day up into sections, because otherwise you can get sidetracked with admin and never leave your computer screen. So I try and do the first part of the day emailing and doing admin, and the afternoon is for fun, creative work. I’m a night owl, so I’ll often work late, but I always try to go outside at lunchtime, to walk around and have a break. This is my side hustle, basically, because it started very much as, well, not a real business. I had absolutely no plan, and it’s grown organically. It happened by learning, throwing myself into everything, doing every event under the sun and making every product. Now I’ve done all of these things, I’ve written a book and illustrated a book, what do I want to do next? I’m just not the person who does one thing. And having a break, by working for someone else, has given me a lot of time to think about what I want to do next. There are a lot of cushions in the world, do I really want to be someone creating more? Could I be doing something more special? What I’d really like to do is bespoke, one-off pieces that focus on the print, maybe bigger pieces, wall hangings or rugs. I worked with John Lewis last year and did some rug designs, which are now in the shops which is really cool. Working in another dimension was really exciting. Probably a product designer, or I nearly went into architecture... but when I started the art foundation, it just clicked. I love trashy TV, Love Island. It’s totally Love Island. I’ve just got this really great book, Little Black Book, by Otegha Uwagba, who runs Women Who. It’s such a good read, and it just reminds you of all the things you forget that are really useful. It’s about confidence building, key skills, remembering to breathe when you are doing public speaking... just really good tips, for everyday life situations. It’s really inspiring, and a nice reminder that everyone feels the same way. I’m also reading Just Kids, by Patti Smith, I’m halfway through, it’s so good. What’s you rescue snack of choice? Oh my god, Naked bars. I’m obsessed. The peanut one is so good. And the cashew nut one. And they can’t be very good for you, because it’s a lot of sugar... but, it’s good sugar...? I’m just not the person who does one thing. It’s at the studio, drawing, designing, painting and getting messy. Being surrounded by inspiring things that I’ve collected. Terrible. I’m getting much better.I never used to take weekends off, and then I hit my 30s and just can’t do it anymore. I don’t know where my energy came from. I really love the V&A, I feel like that is my pattern home. They have an incredible textile archive, and I teach a lot of workshops there, which means I know a lot of secret back routes with incredible staircases. Wanting to meet more creative women and make new friends, and maybe find someone to do something with. I’d love to do more collaborations. Oh god, I just never leave east London. Clapton, or here at the studio. Saturday mornings I’m always in here, but I like it because it’s really quiet. There’s an amazing place called Fingers Crossed for brunch, and a yoga place next door. It’d probably be all my favourite pattern people... Vera Newman, she designed incredible scarves in the 50s-70s, really iconic. Celia Birtwell, Ossie Clarke, Iris Apfel, and then Lena Dunham, because I’m really obsessed with Girls at the moment. I’d love to be able to sing, or be musical. I wish I’d made the most of piano lessons when I was younger. Definitely the books, that was a very proud moment. The first one is all about how to print fabric, it was brilliant to do. I wanted to encourage people to print at home, starting out with equipment they’d have lying around the house, and ending up with the potential to have mastered the process. The second book is an illustrated colouring book, called Scandia. I was offered my current role while I was doing press for it, which was crazy timing, but it worked out really well. I was a bit burnt out from doing both of the books, and needed some time out. I’d been running this business for 7 years, and it felt like a good time to step back. I’ve been really lucky to be able to do what I wanted to do, to make print design work, but it’s never been easy. It’s going to be a bit of a masterplan-making year. Focussed on meeting people, making, design prints, doing something a bit more mixed and involved, creating collections and re-inspiring myself. Want to learn more about Zeena? Check out her website here!